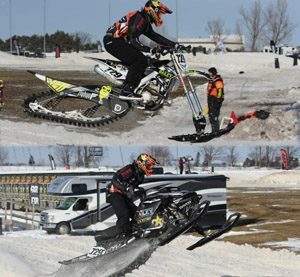 Another weekend in the books, having troubles with my leg after Valcourt I was fighting to keep my speed up on my sled all weekend. 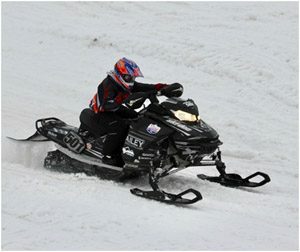 Getting back on the Snowbike this weekend was a nice breather as it didn’t nearly aggravate my leg as much as the sled. I was able to go 1-1 both Saturday and Sunday in Sport Snowbike and had some of my best rides on the bike! Going into Timmins hopefully feeling better and closer to being back to 100% and step on the podium again this season. Busy weekend for me at the races from racing in Salamanca New York Friday night and then back to Canada in Barrie for some more Saturday Sunday, it was a blast getting that extra racing in and come way with great results on the whole weekend with a 2nd Friday night and then winning all 4 of my motos Saturday and Sunday! Now on to Timmins next weekend! Excited for the closest race to my hometown having my family and friends come out to watch! On Saturday Dakota raced in the Junior 10-13 mixed class and looked comfortable, pushing hard in her motos and again in the final taking 3rd! Great job on the weekend, on the podium in both classes! Brooklyn signed up for the Pro Women’s class on Sunday and would line up against the fastest woman in the sport, Megan Brodeur. It was cool to see the two lined up on the starting line! Brooklyn had an awesome day, finishing 2nd behind Megan in each moto and the main event! Congrats! Starting off the season better than I think anyone had expected from me. Going into this season I made a lot of changes and many where mental changes, being able to change my attitude towards racing. Last year I struggled to keep a positive mindset and the fun of snowcross was slowly slipping away race after race with disappointment from finishes I knew I could be doing better at. I told myself this season the most important part was to have fun, plain and simple. I changed my attitude towards everything, made going to practice at The Compound fun by bringing friends up to ride with me! Being able to feel like I’m back to having fun riding my sled is somthing I’ve been wanting to feel for a very long time and this weekend I got that feeling back. Riding snowbike and being able to go have fun on that too this weekend . 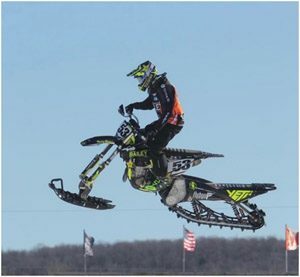 Glen had my sled running awesome and winning my first Pro Moto was somthing I’ve been waiting for a long time in my life and it was somthing I will remember for a long time. Going into the final I had no expectations on how I was going to finish other than to try my best and if I had even less than one more corner I would’ve had the win! But was more than satisfied with 2nd. Thank you to everyone on my team who has supported me and thank you to all our sponsors! 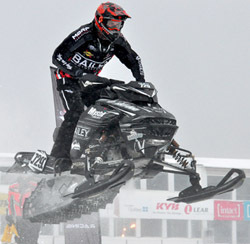 Great weekend of racing to kick off the CSRA season in Sault St. Marie. 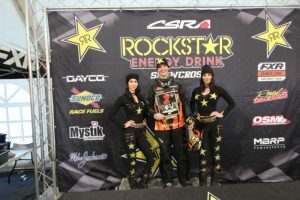 I was able to go 1st in all my motos, Derek at Flybyu motorsports had my Yeti Snow mx dialed in, felt good to be back at the races and line up on the starting line again, big thanks to Rockstar Energy Canada, Troy Lee Designs, HMK, Scott goggles,Tekrider and Deft Family gloves for making me look good out on the track. Now time to get ready to head down to X Games! Leading up to this past weekend things have changed a lot. Shawn’s now working full time! So Grandpa, Uncle Adam and my Mom have been helping me dial the sled in at The Compound. We had a few hiccups getting to Sault Sainte Marie but we didn’t let it get to us down and had a great time. The hole team got to park beside each other! Everyone one was smiling and laughing, even coming together to help each other out form starting sleds to even making sled repair to keep us racing all weekend long. Saturday was sort of interesting to say the least! I decided to try out transition 2 and of course that was my first heat of the day and it didn’t go very well! Third lap in! Yep I crashed in the corner trying to pass someone! So I decided I’m not really ready just yet for that class. So I put my focus on transition 1 and it paid off I was able to go undefeated in all my heats and the finals, giving me the win both Saturday and Sunday The class has a lot of new faces witch is pretty awesome to see, and then in my transition girls class I got second overall again both days, congratulations Dakota on the winning both days! I couldn’t catch you this weekend. I just wanted to thank everyone for a great weekend and thank you to the Barnett’s for towing our trailer back! Horseshoe is the last weekend of the season for some it’s keeping just those few points separating the two from 1st and 2nd, to some that are just trying to get in one last fun weekend of riding. For me that was what I was trying to do, go into the last weekend and come out with races to remember and look back on. I had an okay night Friday under the lights. Saturday I decided to make a decision to ride snowbike for just the pure fact there’s no pressure and it’s all fun. I definitely haven’t smiled during a race all season and being out on the bike chasing around my team mate Shawn on his bike was a good way to keep my head clear. Had some solid finishes Saturday going into the finals. Sunday came around and I had yet another fun day on the snow bike and ended up battling lots of the regular riders for top 5 spots! Highlight was crashing into Shawn in Moto 2 and still pulling out a 5th after waving “bye bye” to another rider up the ski hill for the 5th spot! All weekend on the sled I just wanted to have a ride I knew I was capable of and I always know I can do it and run upfront but it always seems that bad luck gets in the way… all season long! It’s all in my head I know that but for a rider the his biggest aponnent is himself and I let my mind win to much this season. So for the final I said it’s time to run upfront to show I can be there. Hitting the green light first and not letting off till I got to the first jump! Hole shot! Riding like I was running away from the whole pack. After that I was having fun and rode with a smile and ended up 5th. Ended the season trying to make it fun with my family, friends and teammates. Thank you to all our sponsors that make all these seasons possible for me and Bailey Motorsports. Coming in to this season as a Pro rookie I wasn’t expecting anything else but a championship. That was my goal as if being a rookie in the class at 18 years old. 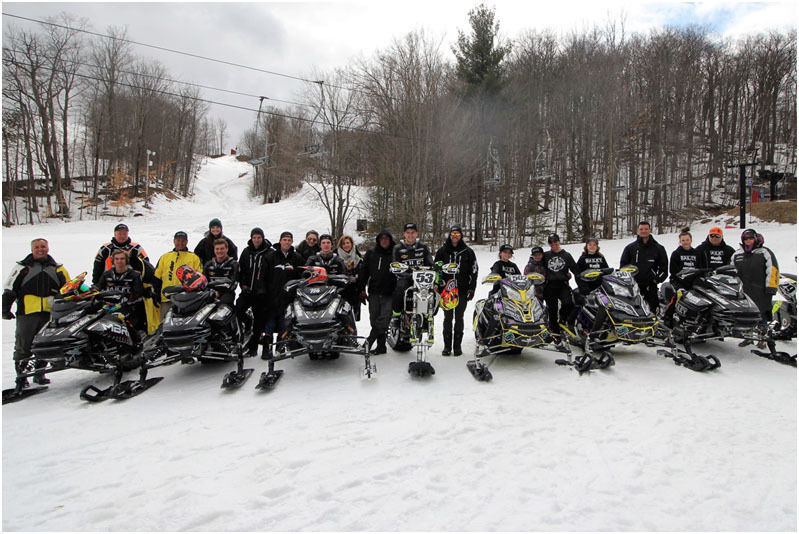 The team I had was amazing this year, they did so much for me with sleds, gear, food, traveling and everything else. I can’t explain how much fun I had being with this team for this year. I struggled to get good starts in finals and didn’t place as good as I wanted too. 5th overall in Pro is a first step in my career. Next year I’m excited to see what happens. I learnt a lot from racing with some other pros in the class. I can’t thank everyone enough with all the support they gave me for this season with all these amazing Sponsors and people within the team. I’ll be back swinging next year for this championship! Can’t wait! Obviously this season did not turn out as I planned. To go out with an injury the first heat race of the year was tough, especially after all the hard work I put in all off season. I want to thank the entire Bailey Motorsports team for keeping my spirits up and welcoming me at the races while I was off. I am super happy to be part of such a great race family. 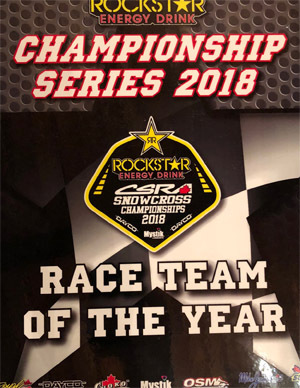 I am impressed with how everyone rode this season, with Ryan and Taylor mixing it up in their first year in Pro, and Yannick and Isaac showing poise both taking home their respective championships. Great job to everyone involved in the team this year and I was proud to contribute the little I did. I hope to be back on the machine when the snow flies again !! Another season of Snowcross racing comes to an end, such an amazing season it was for me from ridding a Snowbike for the first time in December to going racing snowbikecross at x games in January and now winning the CSRA Snowbike championship! Definitely one to remember, huge thank you to the whole Bailey Motorsports team for this great opportunity, had so much fun all season long with everyone! I entered the season a little nervous being only 13 and planning on racing the junior 14-15 with some really competitive guys. The first time I lined up in Rouyn and turned to see the size of some of my competitors I was initially pretty intimidated but I’m really happy I took the chance and was able to learn so much from them throughout the season. In the end I feel I proved myself in the class. It was definitely a highlight of my season when I achieved podium in the class in horseshoe. I battled it out in junior girls all season long with two amazing riders in particular. They always pushed me to be on my game at all times and I look forward to continuing challenging each other next year in the class. From lots of hard work and determination, I was able to pull out the junior girls championship. I was super surprised and humbled being awarded the most outstanding junior racer award and was proud to be the first girl to receive it. I hope there are girls out there that I can inspire to go for their goals no matter what. With a lot of excitement she has this to say! The weather was nuts sunny sky, rain and even snow. Made the race track change every time I would go racing! Knowing it was the very last weekend of racing I had my heart set on doing my very best! Friday morning I went out for practice and came off the track saying to myself I can do this! I’ve been so close in weekends past it has given me a new confidence! In my Transition girls I got some good starts and finished 3rd overall Friday and Saturday. Sunday was by far my most favorite moment in the Transition girls class I got my very first heat win in the afternoon and came second overall for the day. And finished out the season 3rd overall in championship points standings. Then in my Transition 1 class, first off! I have to say this class was tuff! The other races definitely made me work to improve myself every weekend! I got to share a moment I will never forget with all my friends, family and even team watching from the side lines. I went undefeated in all of my heats and finals all weekend long! Going into the weekend I was 5th in the running for Transition 1 championship. I figured I was out of the running for top 3. But the points were pretty close together, and with my consistent weekend going undefeated I made up a lot of points to finish 2nd overall in championship point standings. I couldn’t have asked for a better season. I’m very proud of myself and would like to thank Shawn and grandpa (Glen Goodale) for all their hard work and thank you to everyone supporting me and Bailey Motorsports. What a season this has been. 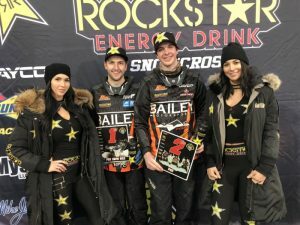 It has truly been an honour being able to work with a team of such caliber and character as that of Bailey Motorsports. 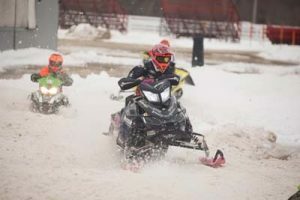 Stuart has asked for my personal input and reflection on this last PR for the 2017/2018 snow cross season. I have given much thought on what to say, so here goes. Snowcross is truly a world unto itself. Trackside at snow cross, the days for the riders, families and crews can be incredibly long and conditions punishing. We are often in subzero temperatures for hours on end, waiting for our heats in freezing winter conditions and cold rainy downpours and then sometimes fortunate to be basking in warm rays of sunshine as spring approaches. But those days are also incredibly rewarding. As a support crew we get to help our racers do their best to reach their goals and achieve things many people can only imagine. I have been told in the past that there are no friends in racing, but I would like to disagree in this sport. While yes there can always those situations that occur between teams in this high adrenaline sport as with other sports, but I have also witnessed great empathy between teams and families. Whether it be last minute help team to team at the line when a sled fails to run. Or when a crew member or parent is injured and other team families step up and help to make sure that that other team’s racers gets to the line for their races. And most recently I have felt the kindness and empathy of other race families towards ours, as we are no longer personally able to compete in the sport. Thank you. 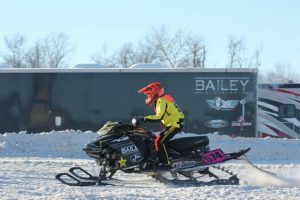 The team and family of Bailey Motorsports over the years has become a well-respected and prominent part of the community of snow cross, and I am honored to be a part of it. Riders supported by the Bailey team are involved in more classes than any other team on the CSRA circuit. 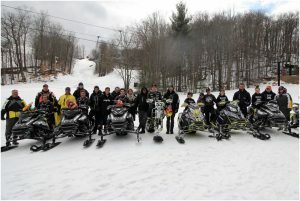 The reach and influence of this team is shown in many classes ranging from snow bike to transition, pro to pro lite right on down to the kids 120 classes. What does the future hold for this team? With the incredible, talented and dedicated athletes on the team roster who knows. Truly the sky is truly the limit. In finishing I would like to not only say thank you to Bailey Motorsports and sponsors for a great season but also to everyone who helps to make the CSRA community what it is. From Jimmy running staging and Phil at the gate to the pits, to everyone in our snow cross family – please accept my heartfelt thanks. 🙂 Look forward to seeing you all next season. As we wrap up the 2017/2018 season and look back on it. Wow what a season filled with a lot of firsts. This season we attend more races then in years past. Giving Hailey the opportunity to experience races she had never been to. And the opportunity to compete in the points championships. Her first race weekend had its ups and downs but somehow we think it gave Hailey motivation to improve throughout the season. Shawn probably will never forgot the moment Hailey got her first ever moto win in the Transition 1 class! she came off cry and laughing all at the same time. After her crash, grandpa told her if you’re going to race with the boy. you gotta keep your elbows up and don’t let off. And that is truly what she did for the remainder of the season making top 3 in both Transition girls and Transition 1 almost every race day. Always a fun weekend in Timmins! Just like last year we all went for an awesome trail ride and there is just endless fun to have in the industrial pit we ride in! Glad to have some well needed fun. The weekend didn’t go as I planned and bad starts and a 1 line track would limit me to being able to pass and gain some points. Trying to stay positive all weekend just trying to get the most points out of the weekend as possible. I’d like to thank all of our sponsors that continuously help us and support us, none of this would be possible without you guys! What a great weekend it was for me in Timmins winning 1st overall Saturday and Sunday. Felt really good to be racing closer to home with lots of friends and family that came out to support me, it was cool seeing everyone. Big thanks to Bailey motorsports for another awesome weekend! The weekend was a learning curve doing good in the qualifiers and crashing in the final and making my way back up to 4th! Sunday I went 1-1 in the qualifiers and in the final I was chasing down 1st place and my sled had problems and I wasn’t able to finish. Another weekend of racing in the books. Just going to focus on the next race weekend!! Did not achieve the results I was hoping for Was a little different style of track then I’m use to and just couldn’t seem to gain ground. 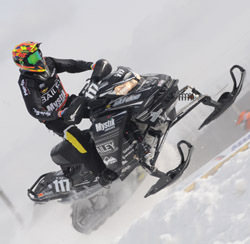 Really disappointed that my sled broke but determined to make up some points in Chicopee! I can’t believe the weather this season! Leading up to this past weekend in Timmins the weather was like a yo yo ball! thankfully the compound has plenty of snow and I was able to continue practicing and preparing for the weekend! FEB 17-18, 2018 KAWARTHA CUP LINDSAY, ON. Lindsay was not the best weekend for me going 2nd and 3rd, struggled with the track having lots of ice edges on it and got a few get offs that left me a bit sore. Overall learned a lot and will be back stronger for the next one! Thank you to everyone that supports us. What to say about this past weekend in Lindsay! It was a pretty crazy weekend! I got 3rd overall in transition girls and I even got my very first heat win in transition 8-10 and came out with a 2nd overall Saturday giving me a hole new confidence about myself. Sunday definitely had it’s good moments and bad moments! I got 2 overall in transition girls with a pretty intense battle for the finish line in the morning with my team mate Dakota. I wasn’t sure witch one of us crossed finish line first. I once again i won the morning heat in transition 8-10 but crashed pretty hard off the start in the afternoon moto battling with some of the other racers and was unable to restart with everyone! Thankfully I’m ok with a little rest I’ll be ready for the next race. 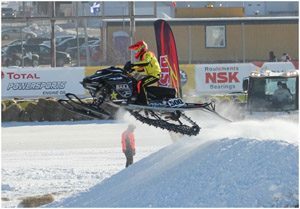 FEB 9-11, 2018 GRAND PRIX SKI-DOO de VALCOURT VALCOURT, QC. Valcourt was a great experience this weekend. Had an awsome weekend despite not getting on the podium I still felt I achieved my goals for the weekend and rode well all weekend long. The track had to be my favourite to date, with some serious high flying jumps too! Friday went well. I felt good on the sled after we got my Enzo suspension setup ready and Glen had the sled rippin. Ended up with a 3rd and then unfortunately for the rest of the day I wouldn’t get the starts I was looking for and had a hard time getting up through the pack. Saturday and Sunday went a lot better with several top 5 finishes in my Motos and two 3rds both days would send me right to the final! Hard competition I had to try and do the best I could to gather up some points. Looking forward to next weekend and trying again to make it onto the podium! 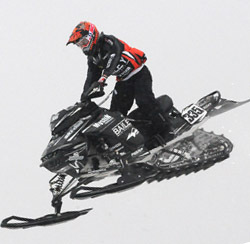 Skidoo’s Grand Prix race in Valcourt is always a fun time and race. 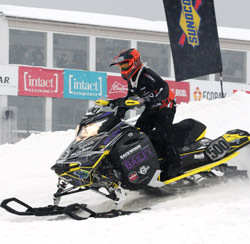 It’s always exciting to be racing against the big teams from the states again and to be in skidoo home town. Track was amazing this year with their layout, including the cool new elevated start witch I really liked. Rode hard and solid all weekend and placed 7th and 8th in both Pro Finals. Excited for what the next race brings! Such a great race weekend for me in Valcourt sweeping all my heats and both finals! New track design was challenging for us on snowbikes but my Husqvarna Canada bike equipped with Yeti Snow kit was working awesome. Track had plenty of snow made it super fun for us. Can’t thank my team Bailey Motorsports enough for an awesome weekend. 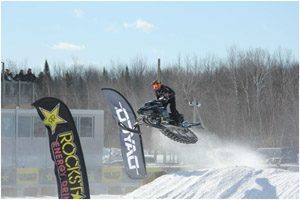 This past weekend racing at Valcourt was one to remember. Friday night I raced in the pro/prolite class and went 3 and 3 in my qualifiers. Going into the final I didn’t know what to expect and with a 15 lap final I ended up 11th which I was very proud of. Saturday and Sunday I raced the prolite class and managed to grab both final wins staying consistent and smooth while getting a good start!! Overall an amazing weekend. The track was unreal with huge jumps and a technical rhythm section!! I had a great weekend in Valcourt and it was an awesome experience. I’m really happy that I got 5th in Junior 10-13 and 5th in Junior 14-15. This weekend was my first time racing against Women, some of which are Pro Women and I’m stoked to say that I placed 7th in the final. Overall it was a really good weekend. 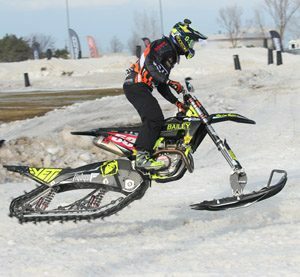 JAN 12-14, 2018 INTERNATIONAL SNOWCROSS GRAND PRIX ROUYN-NORANDA, QC. 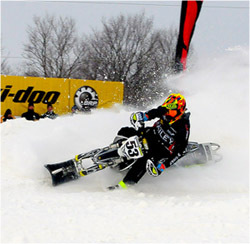 First round of the CSRA snowcross was a weekend of ups and downs. Ready and having more practice than ever leading up to the first race I was ready for the light to go green for the first time in pro! Fighting the tough weather conditions and track conditions I went out for practice trying to find lines and get comfortable on the track for the up coming races for the day. Had trouble all weekend with starts and lead me to have to fight through the pack of riders most races all weekend. All throughout I was trying to keep a positive attitude towards the day and my finishes. Sunday I had a good final and dug deep to pull off a 4th in the final and almost taking 3rd! Things to work on but getting through the first weekend was a goal and secondly my finishes where right where I wanted to be for the first round and I can’t wait to build on my results and make it to the podium! This weekend was something I was pumped about for a while, coming in as a rookie in the pro class I was excited to show what I had. Saturday was a fun day, had too motos and caught hard for a 3rd place in the final, was super happy about it. Sunday came around and was nervous and excited to see how day two would go. Rode hard and fast and ended up with another 3rd in the final. I can’t thank the Bailey Motorsports team enough for their support. Also big thanks to Skidoo, Mystik, Scott goggles, and Troy Lee Designs for having everything dialed in. Ready for Round 3 and 4! I am stoked about how the whole weekend went, it was awesome making front row in the older boys Junior 1 final both days. Felt great starting the season off on the right foot winning my first Jr girls race, bummed about falling off while I was leading my Jr girls race on Sunday but happy that I had enough of a lead to finish the race in 3rd. Bring on round 3&4!